After years of making fans look to the heavens to see his towering home runs leave playing fields all over the league, Hammerin’ Henry Aaron was finally honored in a larger than life way. On June 18, 2007, Delta Airlines (at the time the world’s largest airlines) celebrated Hank’s Hall-Of-Fame career and humanitarian work by naming its newly branded Boeing 757 aircraft the "Hank Aaron 755" in his honor. 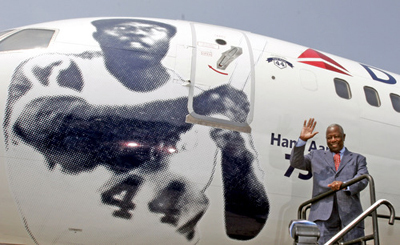 Braves legend Hank Aaron waves to the crowd after unveiling a Delta Air Lines "signature aircraft - The Hank Aaron 755". The event honored Aaron's accomplishments and contributions to the game with a signature aircraft emblazoned with the number 755 – the total number of home runs the slugger hit with the Milwaukee and Atlanta Braves, and the Milwaukee Brewers. The artwork was based on a photo of Aaron's historic 715th home run, which surpassed Babe Ruth as baseball's all-time home run king. Speaking during the ceremony, held near Hartsfield-Jackson Atlanta International Airport, Delta Chief Financial Officer Ed Bastian said: "Mr. Aaron thrilled millions of fans in his years with the Braves, so as Atlanta's hometown airline and the official airline of the Atlanta Braves, Delta is proud to dedicate one of our aircraft to a resident of the Atlanta community who has become a national treasure and a global baseball icon." Aaron broke the home run record on April 8, 1974, going deep off Los Angeles Dodger pitcher Al Downing. Aaron went on to hit 755 home runs in a 23-year career and still holds Major League Baseball's all-time records for runs batted in, extra-base hits and total bases.